Active and affluent are two words that usually pique bicycle advertisers' interest, so the upcoming 2008 Bicycle Touring & Vacation Guide is a real attention grabber. To be launched in January, 2008, The Bicycle Touring & Vacation Guide will be the source for cycling enthusiasts looking to vacation by bicycle. Included in the free publication will be information on destinations, gear, bicycle travel companies and the know-how needed for a fun and satisfying two-wheeled trip. The Bicycle Touring & Vacation Guide will run the gamut from indulgent four-star cycling excursions to do-it-yourself self-supported adventures. From road riding to off-road, single-track touring, The Bicycle Touring & Vacation Guide will take you there and show you how to plan your next adventure. For advertisers, The Bicycle Touring & Vacation Guide will be your chance to reach an active upscale market who love to vacation by bicycle. Throughout its pages, The Guide will offer advertisers the perfect opportunity to highlight their products and services, whether it be equipment  from bicycles to tires; destinations in both the U.S. and abroad including bicycle friendly inns and bed and breakfasts; or tour companies, both large and small that offer everything from fully-supported, pampered outings to do-it-yourself camping trips. The Bicycle Touring & Vacation Guide will feature a print-run of 50,000 copies that will be distributed free to consumers throughout America's finer bicycle stores and will be an annual resource that cyclists will keep for years to come. Reach over 50,000 active, upscale cyclists who love vacationing by bicycle. Magazine will feature gear, destinations, tour companies, inns, etc. Will be the resource for bicycle vacation travelers who are devoted to the bicycle touring lifestyle. Don't delay, advertising deadline is approaching. For a media kit and sample pages, go to: www.bicycletouringandvacationguide.com. Coyne Publishing produces numerous cycling publications including the highly popular Recumbent & Tandem Rider Magazine. 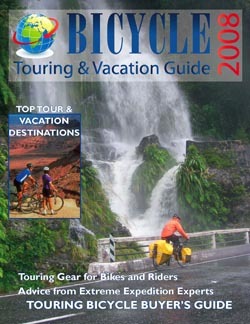 Its 2008 Bicycle Touring & Vacation Guide will be published in January, 2008. For more information, call toll free 1-800-351-2738 or go to www.bicycletouringandvacationguide.com.